Next stop on the “How America has hurt other countries” tour : Hiroshima. 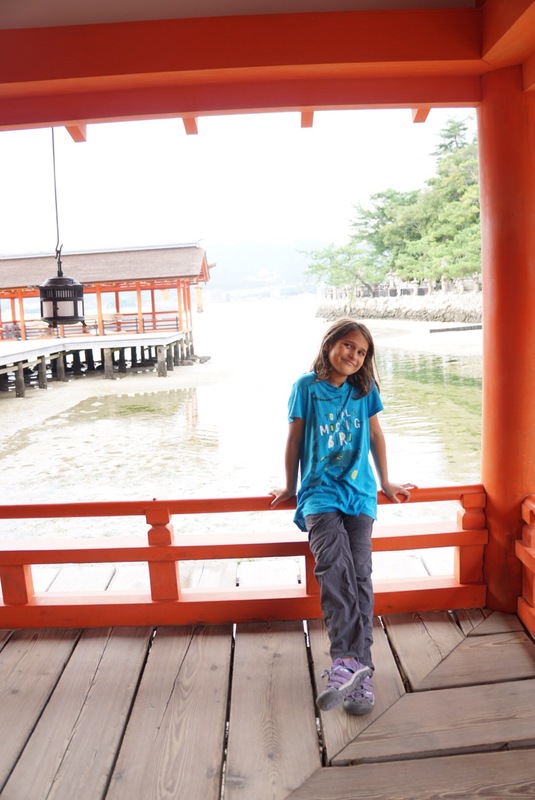 Without missing any trains or transporting bodily fluids, we rolled into Hiroshima, found our apartment and after a bit of chilling headed out. It’s a small enough town that it can be entirely covered on foot. 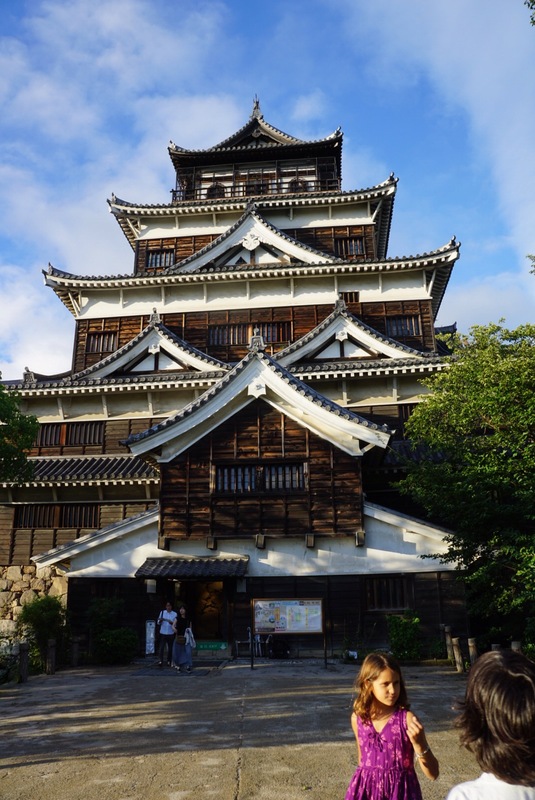 We first headed towards the castle, an old Samurai castle that has been refurbished and now has a small museum in it. There were a lot of old Samurai armor sets in there, and the most striking thing was how small they were! 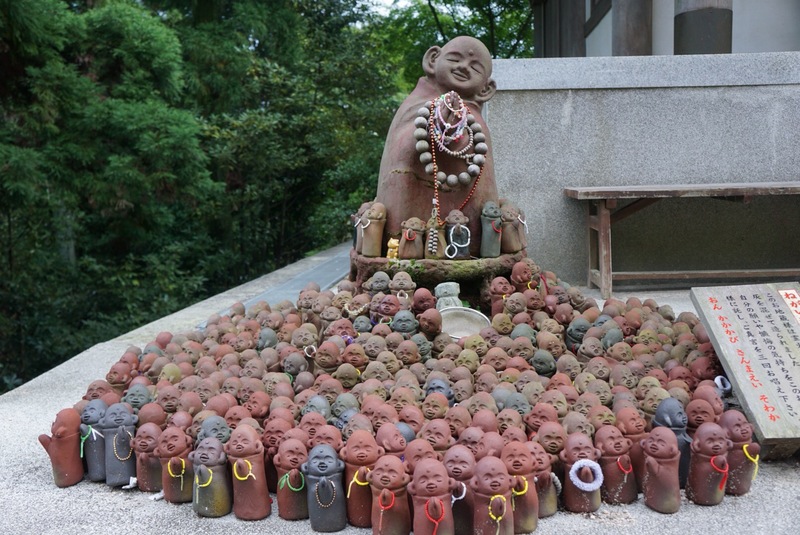 Some of them would have been too small for the boy, and these were the fearsome warriors of Japan! Unfortunately no pictures of the samurai allowed. On the fifth floor, which overlooks the city, they have those telescopes that you put 50 yen (50 cents) in to look around. The boy did this and I took a turn afterwards, able to see the atomic dome and the stadium and then HEY what’s that sign that says “CRAFT BEER” and has a lot of tents next to it? Our destination was determined. 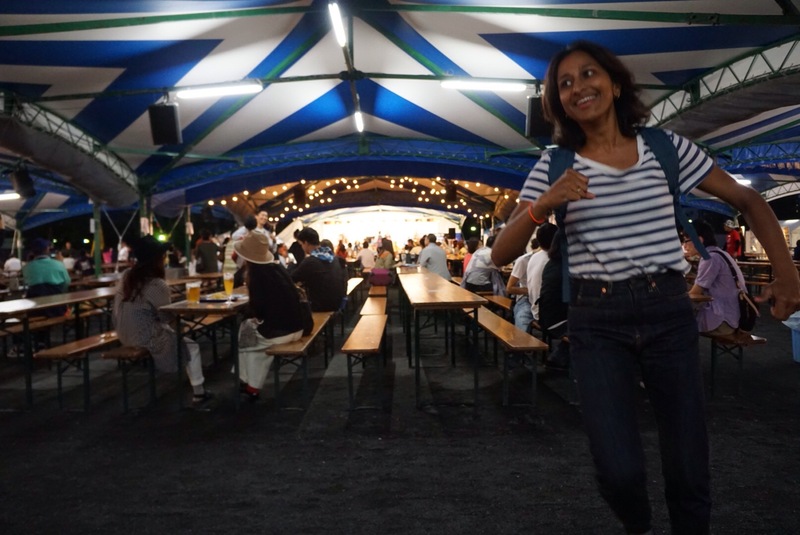 We walked off in the general direction of the sign, looking for the tents and found ourselves in Japanese Oktoberfest! The polka band at the front was playing the chicken dance, and little Japanese grandmas were dancing at front. 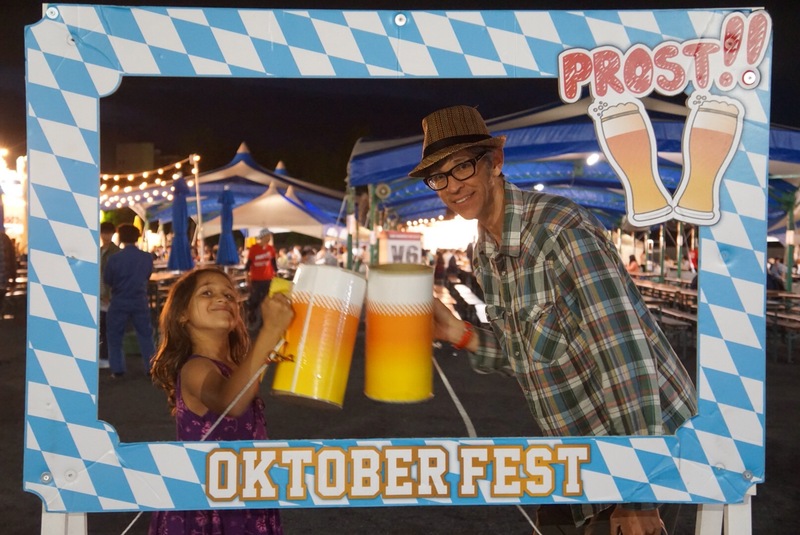 There were several different German beer companies with stalls, and we settled down with a glass of beer to enjoy. We headed home and got dinner from a 7-11. Before you think I fed my children Funyuns and slurpees for dinner, let me say that 7-11s are a different breed here in Japan. They have actual delicious food for super cheap. We got a few onigiri (rice balls) in a few flavors, some savory snacks, some desserty snacks, and beer and sake for 2000 yen ($20). A stop at a nearby supermarket yielded some fruit and we were set for the evening. I had to wonder, why are 7-11s at home such dens of destitution and decay? Why can’t onigiri come to the US instead of those sad hotdog machines that roll overcooked hot dogs until they are entirely dessicated and could be used for building material? 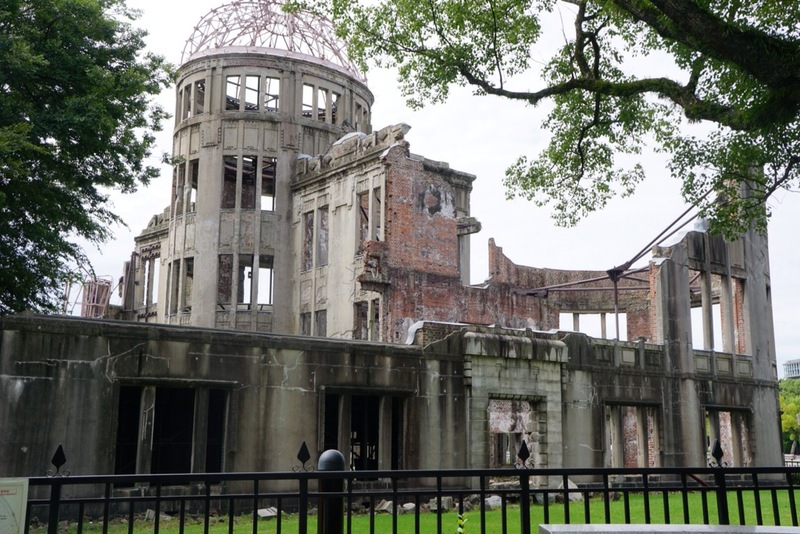 The following morning we went to the Hiroshima peace park, Atomic dome and museum. 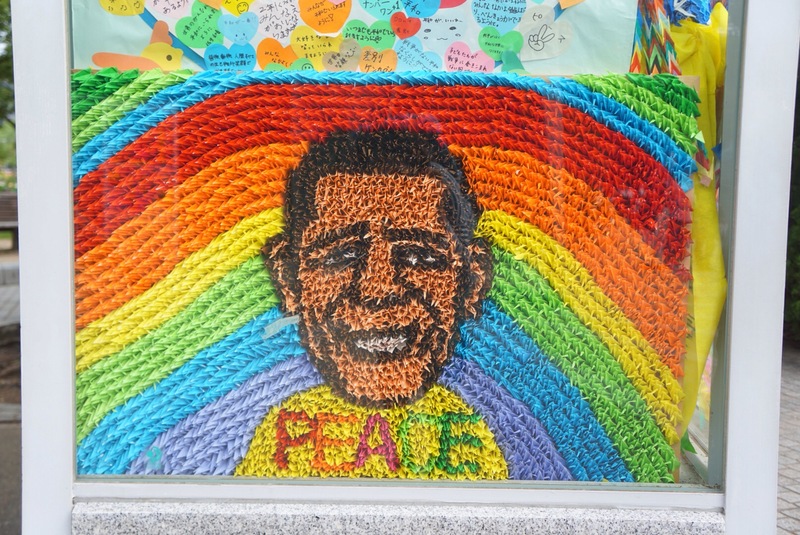 Readers, this was a sad, sad day for us all. It’s impossible not to feel the degree of devastation wrought by the bomb here. I’ve always learned that dropping the bomb was entirely unnecessary at that point in the war – the Japanese had all but capitulated – and to do so was simply brandishing our power to the Soviet Union. But what a cost, the degree of suffering of so many civilians and especially children. The intense heat rays felt for miles around were absorbed by dark colors more than light, so people who wore striped or patterned clothes had these burned into their skin. Many people simply died hours or days later of the severe burns, and even more developed cancers that killed them later. 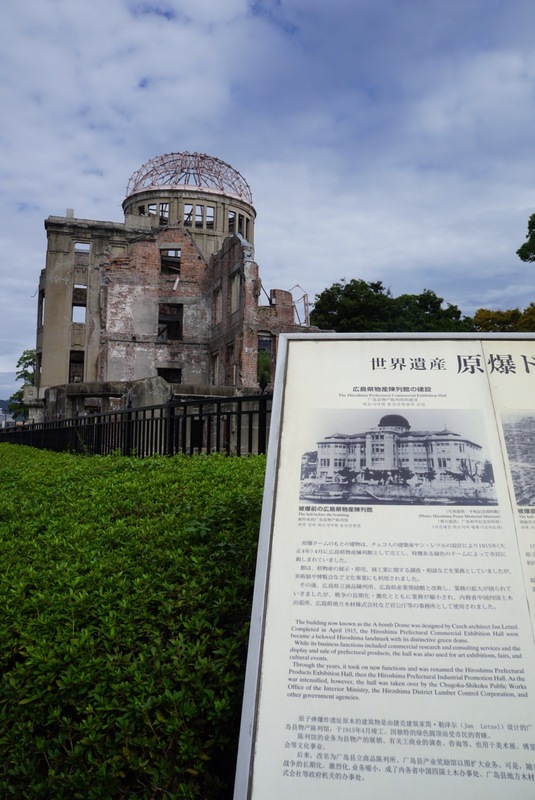 The city itself was largely levelled, except for some buildings which survived, like the Atomic Dome building, the shell of which remains as a testament to the power of the bomb. The kids felt this especially – how could the US do something like this to other humans? It’s one thing to know about the atomic bomb dropping as an abstraction, it’s another thing to see the destruction and the humans affected by it. They were deeply saddened by the museum and the history of it. There’s a section of the museum dedicated to Sadako, of the thousand paper cranes, and even has some of the cranes she folded herself. 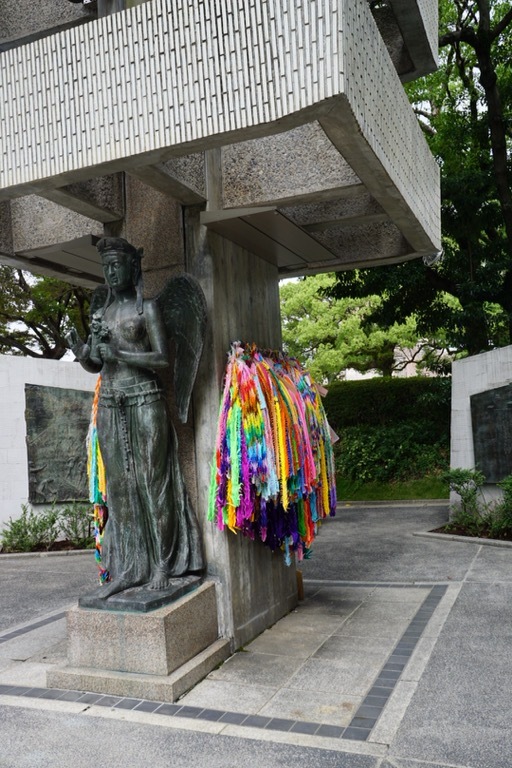 In the Peace Park there is a statue and around it are displays of the cranes that children from all over the world send to them in tribute to peace. 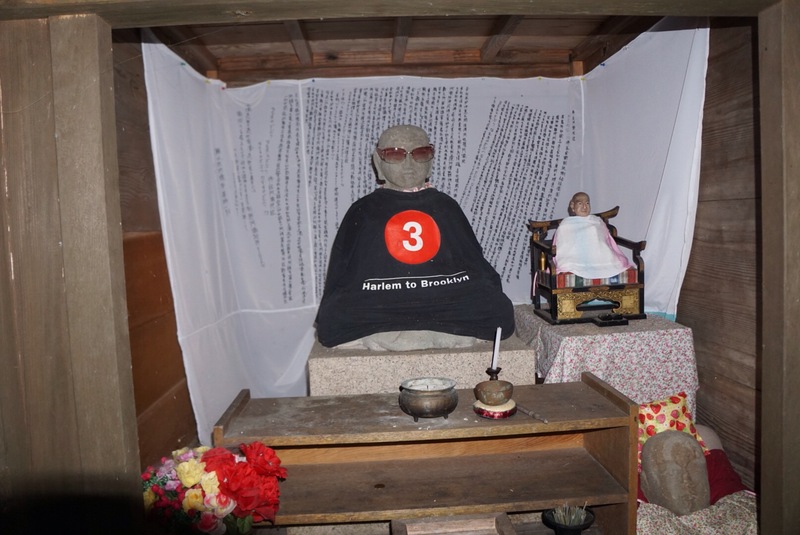 They take them and recycle them into postcards, and give them to you at the end of your museum tour, asking you to spread the story of Hiroshima and the quest for a non-nuclear world so that others do not suffer the same fate. In the afternoon, we split up. 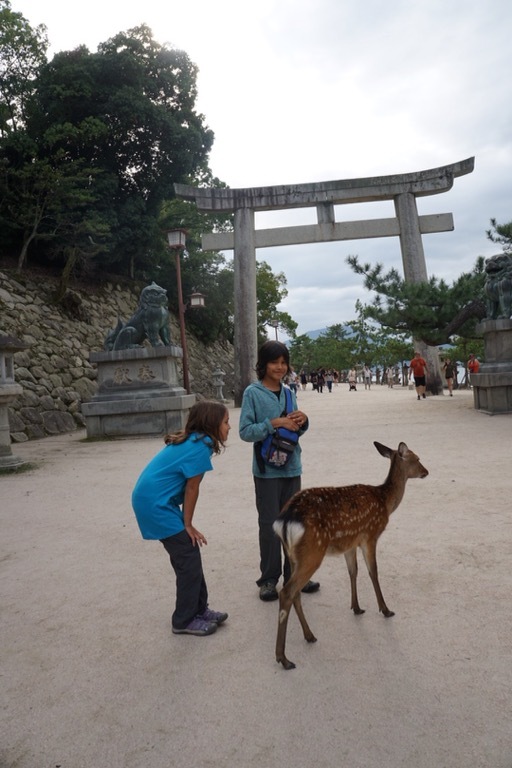 Eric decided to stay in town and try to go for a run and I really wanted to see Miyajima island and the kids came with me. 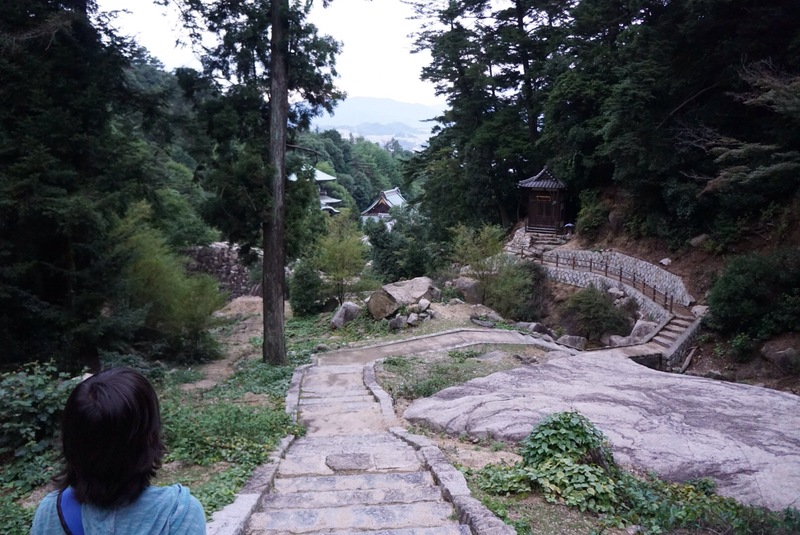 It was one of the most beautiful places I had seen in Japan, and was a nice contemplative and peaceful counterpoint to the morning.. It’s full of shrines (hence the name, which means “shrine island”) and has a forest that rises up over it all. 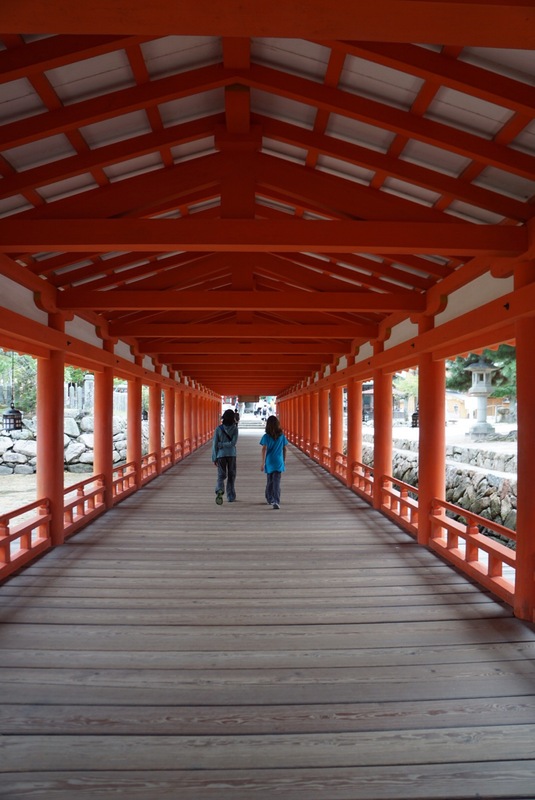 It’s known for a massive torii gate that appears to float on water at high tide, alas we were there at low tide. 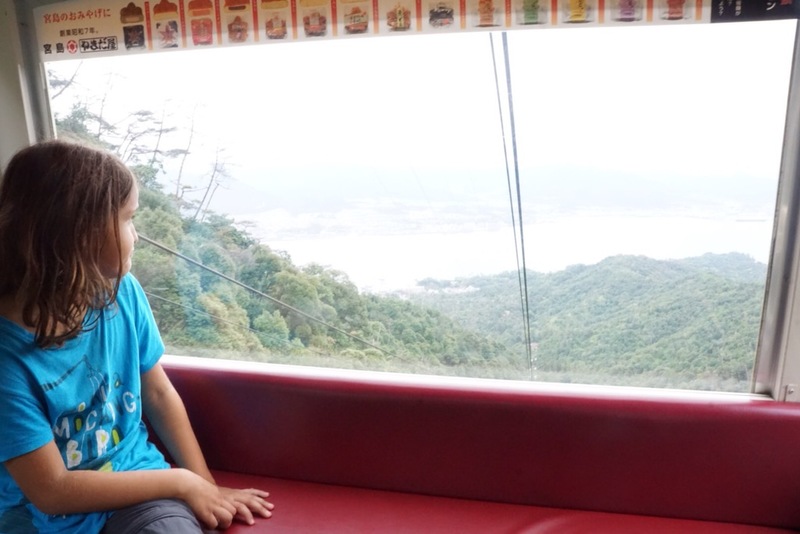 You can take a funicular to the very top for a stunning view. 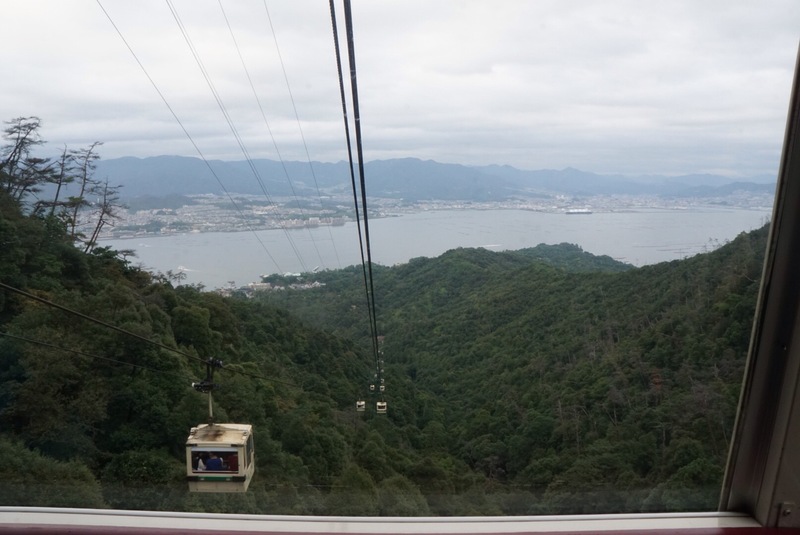 I hadn’t known that the last car down was at 5:30 pm, and it was already 4 pm by the time we made it up to the cable car station. Well, we were there, right? The kids committed to walking down (estimated time, one hour) and so we bought a one way ticket up. It was so pretty, all of it. 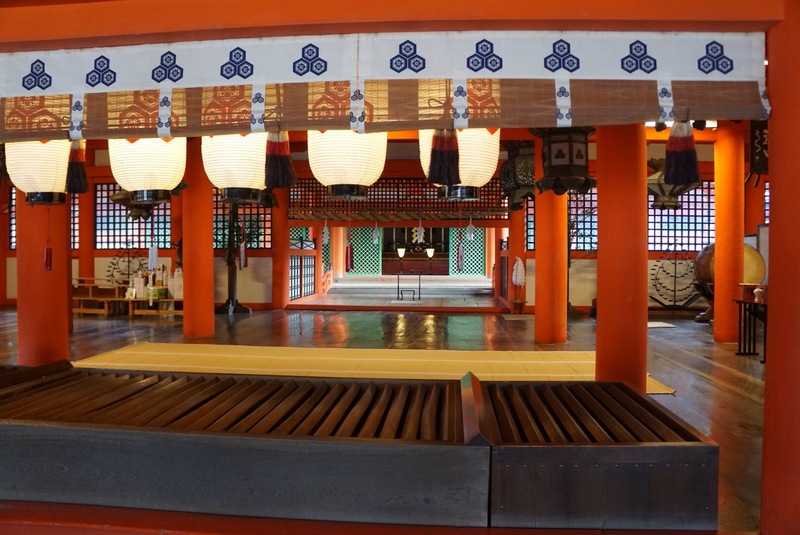 The views, the forest, even the shrines which were peaceful and contemplative without all the people crowding around them. Not wanting to be up there in the dark as the sun would set soon, we couldn’t lollygag as we liked and headed down. We started our hike down the mountain, and it ws so beautiful and green, the most nature we had seen in weeks. I relaxed in anticipation of a serene hour down the mountain. 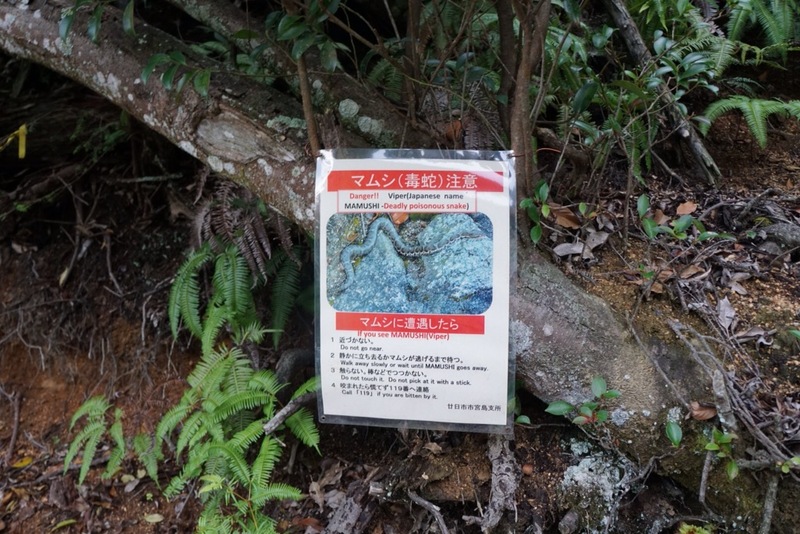 Just then, we saw these signs warning us of the deadly japanese vipers on the mountain. Umm…would have been nice if someone had warned us of these BEFORE we decided to take the walk down. The girl began whimpering. I did that thing where I know I have to hold it together as the only responsible adult around even though I’m actually terrified too, and said, “It’ll be fine! It’s just like hiking at home and the signs warn of rattlesnakes and we never see any!” Shortly thereafter a SNAKE ACTUALLY SLITHERED ACROSS OUR PATH. It was a slender thing, and stayed out of the way and was probably not the deadly viper. You wouldn’t have known it by the way that I screamed, though, all pretense of calm adult gone. The rest of the way down, the girl paused at every step to check for snakes first. 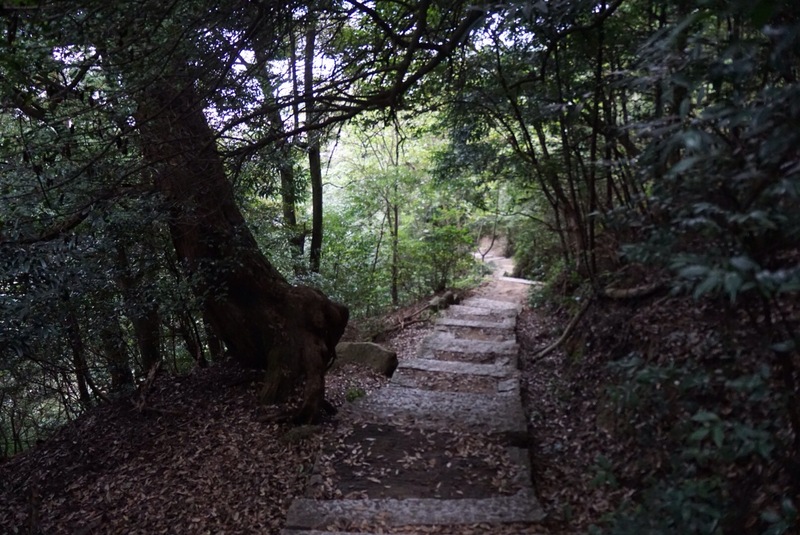 There were a LOT of steps and what was initially a very peaceful and pleasant hike became one with potential terror lurking under every step. 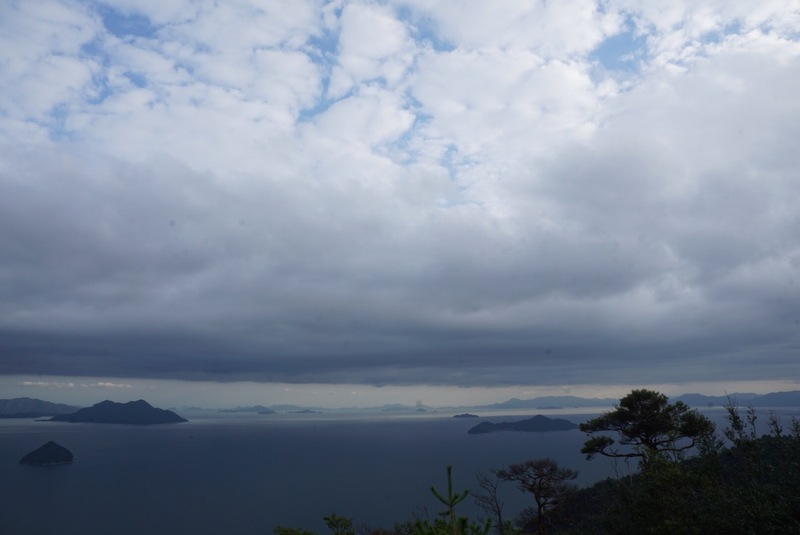 No further snake sightings were to be had, thankfully, we did manage to enjoy the hike and we made it back onto the ferry and home, meeting up with Eric for some conveyer belt sushi, our Japanese comfort food. I love the way your family travels!